Siegel Architects, P.C. 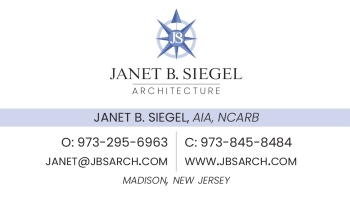 provides thoughtful architectural design solutions in Chatham NJ and the surrounding area. With over 75 years of combined experience, our staff can provide expertise in classic or contemporary design standards to meet your unique needs. Licensed in five states (NY, NJ, CT, VT and MD), we specialize in residential alterations and additions, custom and new homes, vacation homes, kitchen and bath renovations, small-scale commercial and community projects.